When funds and resources are used for real conservation by protecting elephants in the wild, natural cycles of multi-generational families and cultures thrive, and populations increase. This is a starkly bright and much-needed contrast to building multi-million dollar zoo exhibits where elephants live and die unnaturally. We are celebrating the first elephant birth on record of 2018 by The Amboseli Trust for Elephants in Africa! A female baby was born to an elephant named Soit Nado. The Amboseli Trust for Elephants in Africa, led by Dr. Cynthia Moss, works to ensure the long-term conservation and welfare of Africa's elephants in Africa – where these elephants belong! An elephant birth in the wild is a real cause for celebration. Unlike elephant calves who are the result of captive births in zoos, this baby will be greeted and welcomed by her many relatives. 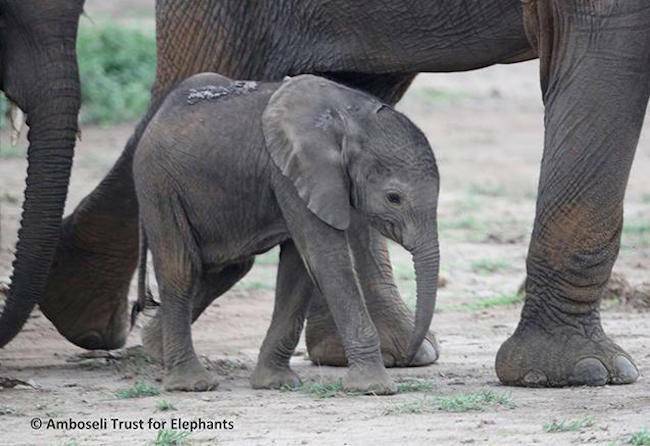 Her bond with her mother will be unbroken for life, and all will participate in helping her find her way in the wild elephant world, as she grows up to have babies of her own and the circle of life will continue. Life isn’t guaranteed in the wilds of Amboseli (or anywhere in the world), but this baby represents a life that statistically will be a longer and fuller life than an elephant born in a zoo – and in the wild, she can directly contribute to the herd through sociality, knowledge, and reproduction! Congratulations to elephant mom Soit Nado, and to the Amboseli Trust for Elephants for studying and protecting African elephants in the wild – where they belong!